Our English speaking driver will meet you at your hotel or pick up location at the requested time to begin this daytrip with a lovely ride from Rome to the region of Italy called Umbria. The ride to Assisi takes about 2 hrs. 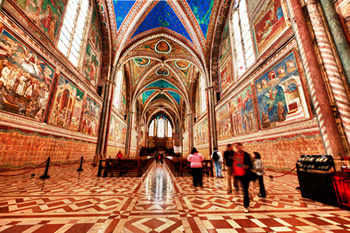 Where we will visit the famous city of St. Francis which is in the heart of Umbria. Beautiful countryside to see along the way and we can make stops for wine tasting or visits to other cities like Spoleto, Orvieto, Todi and Deruta (famous for ceramics). The trip to Assisi is great opportunity to visit this Umbria area, this region of Italy rivals with Tuscany for the beauty of the countryside. Assisi was, in the pre-roman age influenced by the nearby Etruscans. Assisium was its name as it became a Roman municipality. After the fall of the Roman Empire, Assisi was taken over by the Goths then recaptured later by the Byzantines. Assisi flourished again during the 11th and 12th centuries as an independent township, though it was troubled by wars. St. Francis and St. Claire were born here during this period (St. Francis 1181, St. Claire 1193). From the 16th century to 1860, except for the brief Napoleonic period, it was part of the Papal States. Stone-cutters and masons gave Assisi an incomparable appearance, and time seems to have stopped before its beauty. Its narrow streets between buildings built with in the typical local stone called Pietra Subasia with their red tile roofs make you think you've been traveling in a time-machine, rather than in a in normal car, to get there. Arriving in Assisi we stop to see the Church of Santa Maria degliAngeli, which is at the bottom of the hill, and then climb to the town to visit St. Damiano Church where St. Francis heared the Byzantine Cross speaking, St. Claire's Church with her elongings and lastly the Basilica of St. Francis, the patron of Europe. We will then enjoy a beautiful drive through the Umbrian countryside with quaint medieval towns dotted along your route. 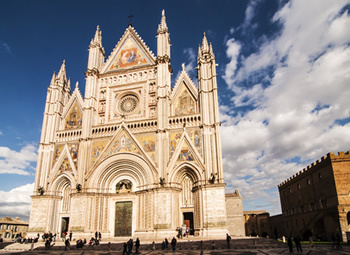 A short drive from Assisi brings you to the picturesque town of Orvieto, which boasts one of Italy's finest and most impressive gothic cathedrals. Be sure to take in the scenery, as the town offers stunning views across its vineyards and fields. Comfortable walking shoes and suitable dress for an excursion to the mountains above 1000 meters are recommended. Assisi is partially wheelchair accessible.